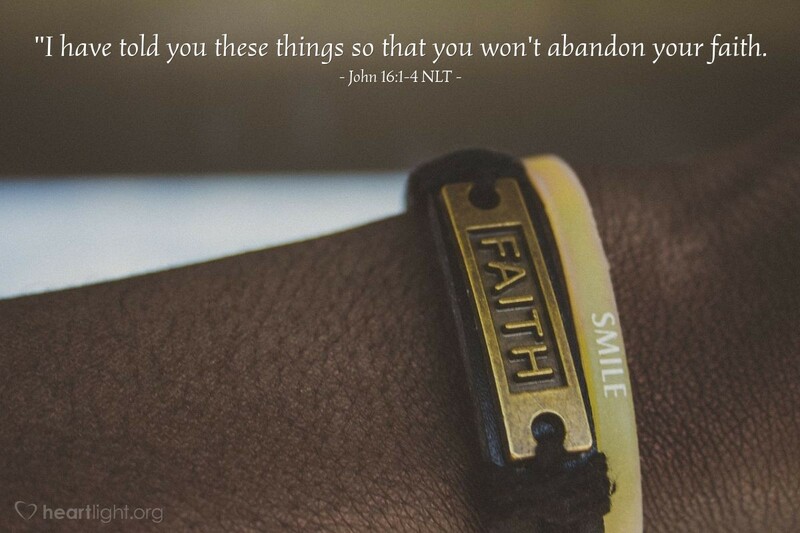 [Jesus said,] "I have told you these things so that you won't abandon your faith. For you will be expelled from the synagogues, and the time is coming when those who kill you will think they are doing a holy service for God. This is because they have never known the Father or me. Yes, I'm telling you these things now, so that when they happen, you will remember my warning. I didn't tell you earlier because I was going to be with you for a while longer." Jesus doesn't pull any punches with his disciples. What happens to the Master will also likely happen to many of his disciples. They need to know that Jesus had warned them so they won't be overly discouraged when it does happen. Amazingly, Jesus' concern in the face of his own death is his disciples' preparation for facing similar struggles. Jesus wants them to know that they are not alone and what they face was something to be expected. Jesus warned them about it before he returned home to heaven. Father, please bless those who are being persecuted and mistreated because of their faith. Give them the courage to stand up to the onslaught and mistreatment. Be present with them through your Spirit; not only guide their words but please also give them strength. In Jesus' name, I pray. Amen.